In the Caribbean island of Guadeloupe, Bokanté means “exchange.” I can think of no better name for a band with such a diverse sound and collection of musicians since every song they record features something new and breathtaking. This is especially true in their collaboration with the Metropole Orkest for their sophomore album, What Heat. Bokanté was started by Michael League, the leader and bass player of the Grammy Award winning jazz fusion group, Snarky Puppy. League formed this group after meeting Guadeloupian singer Malika Tirolien on a gig in Montreal when her band was opening for Snarky Puppy. The two began writing songs together over email and then assembled Bokanté to record the band’s 2017 debut album, Strange Circles. The band is comprised of world renowned musicians including lap steel guitar player Roosevelt Collier; guitarists Chris McQueen and Bob Lanzetti; as well as percussionists André Ferrari, Jamey Haddad and Keita Ogwa. 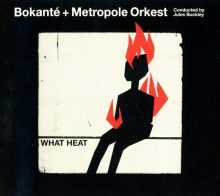 Now, alongside Netherlands-based Metropole Orkest with conductor Jules Buckley, the group continues to amaze with What Heat. With an album like What Heat it’s little difficult to come up with a starting point because there are so many amazing things that happen through this collaboration of so many outstanding artists. A primary feature is the rhythmic intensity, often found in League’s writing, combined with the full-bodied sound of the orchestra. Throughout the album, Malika switches between her native Creole and French, only singing in English to repeat the title of the opening song, “All The Way Home.” This provides the perfect bed of sound for Malika’s soft yet warm voice as she smoothly weaves in and out of the elaborate textures. “All The Way Home” exemplifies these ideas perfectly as it begins with a rhythmic idea played by the steel string guitar that persists throughout, before the string section makes its thick and heavy entrance along with the percussion section that adds a slow, driving march. Bokanté addresses urgent problems facing society head on, which makes every single song on this album unbelievably moving. Malika demonstrates her ability to convey real and clear emotion, even if you don’t understand the language she is speaking. The messages she delivers are even more poignant upon reading the translations in the album booklet. Malika sings of love found and lost in songs like “Bòd Lanmè Pa Lwen” (The Beach Is Not Far) and “Lè An Gadé-W An Zyé” (When I look In Your Eyes); she acknowledges social injustice in “Réparasyons” (Reparations) and “Don’t Do It;” and she even includes a songs of self-love in “Fanm” (The Woman). Malika is such a prolific lyricist that the other songs must be left up to your interpretation. On its own, Bokanté is a powerful ensemble and outstanding collective of musicians, but partnering with Metropole Orkest takes their music to new heights, creating a mixture of energetic rhythms, robust orchestral sounds, and powerful messages. What Heat is truly a work of art. This entry was posted in Jazz, World Music and tagged Bokanté, CD review, Jared Griffin, Real World, What Heat, World Music by aaamc. Bookmark the permalink.